Studying history facilities students who wish to develop their historical skills, whilst developing their knowledge and understanding of the world in which we live. History is a well-respected academic subject and viewed highly by universities as a rigorous and challenging subject. An appreciation of human behaviour and every job has humans involved somewhere! A deeper understanding of current affairs for use in almost every job interview. An ability to think independently without jumping to unsupported conclusions. An ability to make decisions and judgements based on evidence. A highly desirable quality in many professions. The ability to write coherently and present arguments effectively both orally and on paper. Within our KS3 curriculum we have aimed to ensure that all pupils are competent in historical skills. We strongly feel that the curriculum we have devised, based on the National Curriculum Programme of Study ensures pupils have the necessary skills to engage in historical debate effectively. Pupils develop many transferable skills through Key Stage 3, such as continuity and change, cause and consequence, similarity, difference and significance, and use then to make connections, draw contrasts, analyse trends, frame valid questions and create their own structured accounts, including written narratives and analyses. Pupils develop research skills and through developing methods of historical enquiry, including how evidence is used rigorously to make claims, and discern how and why contrasting arguments and interpretations have been constructed. In each year pupils build upon prior knowledge of the world in which we live to create a chronological understanding of the past. We study a variety of national, international and local events over the past 2000 years. The study of history at Key Stage 3 is important in that it helps pupils to develop an understanding of the world in which we live today. Project on the history of Nantwich. Students will be following the new AQA History specification created in line with the new changes to GCSE introduced in 2016. The course is linear with two exams at the end of the two years, with all four modules being examined. Each module is equally weighted, worth 25% of the overall grade; therefore an equal amount of time is spent on all four. The Restoration England module also has the study of an historical site incorporated into the topics. Each year the site is a different one, nominated by the exam board. Questions on the historical site are incorporated into their final exam. It is not however compulsory to visit the site, though it will be made available if the nature of the site makes it possible. This thematic study will enable students to gain an understanding of how medicine developed in Britain over a long period of time. Students will study the importance of the following factors: war, superstition and religion, chance, government, communication, science and technology and the role of the individual in encouraging or inhibiting change. Students will show an understanding of how these factors worked together to bring about particular developments at a particular time, how they were related and their impact upon society. Topics studied include the Black Death, the Great Plague, Louis Pasteur, scientific developments, Germ Theory, Edward Jenner, development in surgery; barber surgeons, anaesthetics, antiseptics, X-Rays, key hole surgery, the NHS. This option allows students to study in depth the restoration of Charles II after the Republic. The study will focus on the major aspects of Charles II’s reign considered from economic, religious, political, social and cultural standpoints, for example; the Great Fire of London, plays, development of trade, fashions of the period, Catholic Plots to overthrow Charles, Charles’ social life including mistresses and court politics, the Great Plague, its causes and consequences, the beginning of the Slave Trade and the British Empire. This period study focuses on the development of Germany during a turbulent half century of change. It was a period of democracy and dictatorship – the development and collapse of democracy and the rise and fall of Nazism. Students will study the creation of Germany, the impact of World War One on the people of Germany, the rise of Nationalism and the Nazi Party, the collapse of the democratic government – the Weimar Republic, why people voted for the Nazi Party, everyday life during the rule of the Nazi Party including persecution of minorities. This wider world depth focuses on the causes of the Second World War and seeks to show how and why conflict occurred and why it proved difficult to resolve the issues which caused it. Topics covered by the students include the Treaty of Versailles and its impact, attempts to create world peace through the League of Nations and the failure of this organisation to prevent World War Two, aggressive foreign policy followed by international powers, including Japan, Italy and Germany during the 1930s and the policies followed by key international politicians, including Neville Chamberlain, Josef Stalin and Adolf Hitler. Any student who wishes to choose a subject at KS5 and career which requires analysis and evaluative skills will benefit from choosing history at GCSE. Professions leading from the skills and knowledge gained from studying history can include careers in law, the civil service, journalism, politics, broadcasting and teaching. 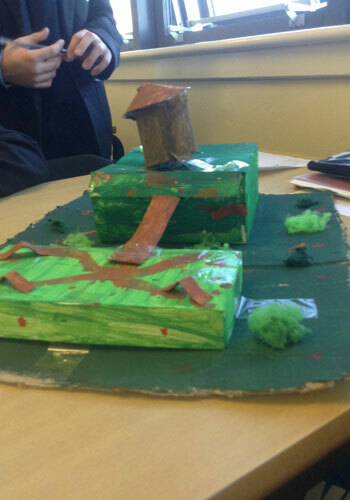 Year 7 assessment was to create a historical castle either Motte and Bailey, Stone Keep or concentric - based on their knowledge of castles. 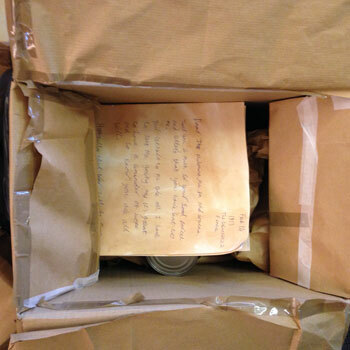 Year 9 assessment was to create a WW1 trench box filled with WW1 memorabilia.